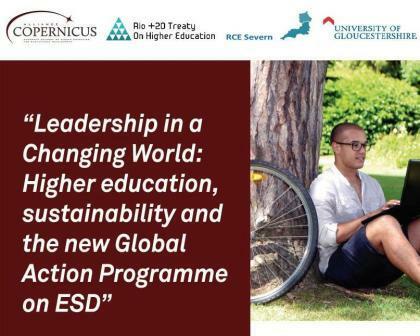 COPERNICUS Alliance (CA) Conference on Leadership in a Changing World: Higher education, sustainability and the new Global Action Programme on ESD (Education for Sustainable Development) will be held at the University of Gloucestershire UK on 10-11 January 2014. This international conference will take place during a major transition period for ESD globally, namely the end of the UN Decade on Education for Sustainable Development (DESD, 2005-2014) and the beginning of the new Global Action Programme on ESD. Bringing together CA members and signatories of the Rio+20 Treaty on Higher Education, it welcomes participants interested in the future of higher education for sustainability. Day 1 will begin with a welcome by Professor Steven Marston, Vice-Chancellor, University of Gloucestershire. In her welcome address, Professor Daniella Tilbury (Chair of the UNESCO Monitoring and Evaluation Group for the DESD and President of COPERNICUS Alliance) will share the headlines from the UNESCO Higher Education Report that will inform the DESD Final Report and dialogues at the World Conference on ESD to be held in Nagoya in November 2014. The first day will also include an interactive panel discussion, discussion groups and parallel sessions. Professor Clemens Mader (Visiting Professor for Environment and Sustainability in the Region at Leuphana University of Lüneburg and Vice-President of CA, Germany) will summarise the day’s dialogues and outcomes and will also share insights on the transformational role of higher education as outlined in the Rio+20 Treaty on Higher Education, an initiative coordinated by CA. The day will also see an interactive panel discussion and a session on sharing of student sustainability projects and will end with CA Annual General Meeting (for CA members only). The reflections and proposals arising from the conference will be presented to the organisers of the World Conference on ESD to be held in November 2014 in Nagoya, Japan.